Want to experience an authentic, old-fashioned New England Christmas? Then you might want to head up to beautiful Woodstock, Vermont. There you’ll find the Billings Farm and Museum, a working farm with an award-winning Jersey herd and a farmhouse museum that is open to the public. At Billings you can take classes, watch documentary films (part of the Woodstock Film Series), and learn more about what life was like in Vermont in 1890, the year that the farmhouse was built. The museum captures the simplicity and difficulty of rural life in late 19th-century Vermont with hands-on activities like buttermaking and milking as well as special exhibits. During each weekend in December, the museum celebrates Christmas at Billings Farm with activities like sleigh rides, sledding, candle dipping, and ornament making. The farmhouse is decorated as it would have been in Christmas 1890, with simple green boughs on the mantels and trees strung with cranberry and popcorn garland, painted pinecones, and paper ornaments. I’ve been to Woodstock, but somehow I missed this landmark farm on my visit. I’ll have to remedy that next time I am in the area! If you want to find out more about old Vermont Christmas traditions, the Billings Farm & Museum is a good place to start. 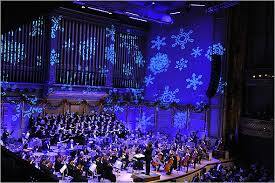 In 1973, Arthur Fiedler, long-time conductor of the Boston Pops Orchestra, introduced the Holiday Pops. The celebration was called “A Pops Christmas Party” and featured the Tanglewood Festival Chorus. Typical of Fiedler’s Pops, the concert was aimed at a mass audience, with accessible, crowd-pleasing musical selections. Over the years, the Holiday Pops has included narrations of “The Night Before Christmas” (some featuring special guests like Boston’s former mayor Thomas Menino), audience sing-a-longs, and guest choirs and choruses. In 1985, the Holiday Pops was televised for the first time. Forty-one years later, the Holiday Pops is still going strong. This year, the performance, which takes place in Boston’s Symphony Hall, features former Pops conductor and composer John Williams’s score to the holiday-themed film Home Alone. The program runs until December 31. The famous Vermont Country Store has been a shopper’s paradise since 1946. The store, with two locations in Vermont and a thriving catalog business, is run by Lyman Orton and his three sons. The store is known for its vast stock of both practical and nostalgia items; their motto is “Purveyors of the Practical and Hard-to-Find.” Peruse their catalog or wander their sprawling Weston or Rockingham, Vermont stores and you’ll find an impressive selection of nightgowns, blankets and sheets, baking tools, Vermont’s famous Common Crackers, and other run-of-the-mill household goods. But and you’ll also come across many nostalgia products, like Tangee lipstick, old-fashioned candy like Mary Janes and Clark Bars, and Fisher Price’s old pull-string phone and milk truck toys. As a history buff, I had a blast visiting the Weston store and wandering through the bins and shelves that evoked old Vermont and American traditions; it was a crash course in New England cultural history. This retail institution is also known for its year-round Christmas shop. There you’ll come across traditional European Christmas fare like marzipan candy and Stollen bread, vintage decorations (glass ornaments, bubble lights, a plastic Santa Claus made from the original 1950s mold), and of course a wide variety of Vermont-made goods. So whether it’s Christmas or Christmas in July, stop by the Vermont Country Store if you ever find yourself in Weston or Rockingham. Just make sure you give yourself a couple of hours to enjoy a stroll through the past. 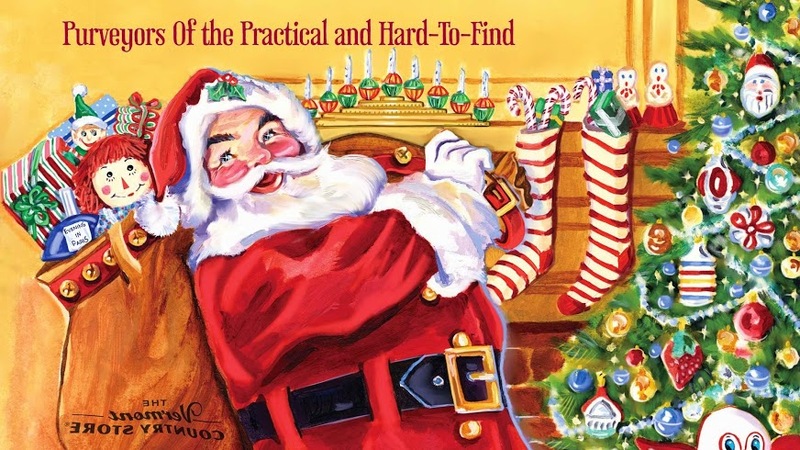 Here is the first in my 12 Days of Christmas series with New England traditions as the theme (it’s actually 11 days of Christmas at this point, but let’s pretend otherwise). I’d like to start with everyone’s favorite Christmas food: the cookie! The popular holiday molasses-spice cookie known as “Joe Froggers” is a deliciously chewy treat that goes back to the eighteenth century. A free (formerly enslaved) African American and Revolutionary War veteran by the name of Joseph Brown ran a tavern with his wife Lucretia in Marblehead, Mass. Lucretia made these delectable, pancake-sized treats and served them up to guests who christened them “Joe Froggers” after the frog pond located next to the tavern. Variations of the story claim that the “frogger” name came from the frog-leg shapes the cookie batter made while cooking in the pan. Fittingly, given the gingerbread-like flavor of this cookie, the Browns lived in an area of Marblehead known as Gingerbread Hill. Joseph was born a slave, and he was called “Old Black Joe” by many whites in town, a breathtakingly casual racist appellation that was common in those times. He became a free man who could own property (thanks in part to the Massachusetts Constitution) after the war. The tavern he and Lucretia ran was integrated, but it was one of the few places in Marblehead, with a population that was only 5% African American, that could be described as such. While much of his history (which regiment he fought in, for example) has been lost, Joseph Brown’s name has been associated with the popular cookies although they were actually created by his wife. The rum, molasses, nutmeg, and cloves in Joe Froggers are ingredients you find in many old-fashioned New England recipes, so this cookie is definitely a paean to the past. And with its ginger and allspice, it’s a perfect treat for the holidays (some modern sweet tooths add frosting, but in my opinion, this cookie is better without it) and remains popular in New England homes and bakeries.